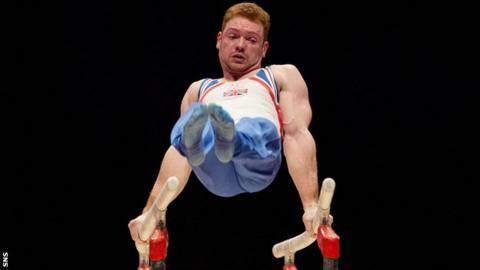 Dan Purvis is the only Scottish Gymnast to have won Olympic and World Championship medals. Not bad for someone who only took up the sport because, in his own words, he was "rubbish at football". The 24-year-old, who was born in Crosby on Merseyside, qualifies to represent Scotland in Commonwealth Games because his mother, Denise, is from Dundee. Purvis, called 'the Postman' by some of his team-mates because he always delivers, was one of the six British men who won silver in the team event at the World Championships in Glasgow on Wednesday - the first time Great Britain's men have won a team medal in the championships. "It was unbelievable, to win a medal at a World Championship in front of a home crowd is incredible, we had to pinch ourselves - it's another dream come true," he told BBC Scotland. Not the kind of thing that filled his dreams when he was a seven-year-old boy. "My big brother was a good footballer and I was hoping to follow in his footsteps, but I was terrible at it, I kept scoring own goals and was just running about a bit mad," he explained. "Then one of my teachers suggested I try gymnastics because I had so much energy and I just loved it straight away; running about, jumping all over the place. "When I got to about 10 years old I thought this is something I want to get a crack at. Then when I was 15 I felt I wanted to get a career out of this. "At the start I spent about 20 hours a week training, it was a long time. I had to quit Beavers and Scouts and I was quite upset about that. It's a hard sacrifice as a youngster - all gymnasts or sports people will find that - but it's been worth it, especially coming out with achievements like a world silver medal." Purvis says a lot of the credit for his success goes to life-long coach Jeff Brookes. "We've had an up and down relationship to be honest, I think I frustrate him a lot," Purvis said. "When I was younger, it was difficult for me to know how to twist, how to run and so on. "But Jeff's been behind me 100% of the way and without him I wouldn't have achieved anything." Although his most recent success has come in a Team GB vest, some of his medals have been won in the blue of Scotland. "My mum's from Dundee and when I was growing up I used to spend a lot of time in the city visiting family," he recounted. "When I was emerging as a gymnast I used to talk to [fellow Anglo-Scots gymnast] Dan Keatings about representing Scotland. It's something I'm passionate about. "It was great to see so many members of my family here in Glasgow to watch me win a medal in the team event for GB." Purvis competes in the individual all-round event on Friday at Glasgow's Hyrdro Arena, having qualified with the third highest score. And he has identified Japan's Kohei Uchimura and GB team-mate Max Whitlock as the men to beat. "I've qualified for a few all-round finals in the past and have narrowly missed out on a medal," he said. "Qualifying for this final as third best is quite an achievement itself but I'm going to go and give it my best shot, there are about 10 guys in the final who could all win medals. "Uchimara is incredible, a five-times world champion and then Max is just fantastic too, he won silver at the worlds last year. But whoever can put together six clean routines is in with a chance of a medal." Purvis has a reputation as being reliable and GB team captain Kristian Thomas says Purvis "always brings his best to these competitions". "You know you can depend on him to perform a clean routine," he added. "But away from the gym he's quite laid back and always makes us laugh, often for the wrong reasons because he's done something stupid. "For example, he'll try to make sure we all bring the right kit for tournaments, then when we turn up he's the only one with the wrong kit, but he's just such a lovely guy and a pleasure to be around." Purvis, who won a team bronze at London 2012, will also compete in the floor exercise finals on Sunday - the discipline in which he won bronze at the World Championships in 2010. "I keep thinking that this could be my last World Championship, I'm getting older now, but I'd like to get to the Rio Olympics next year that's really what this whole cycle is all about, getting to Rio. "I still wake up thinking about that and our historic achievement [in London] so I'm going to give it my best shot to get to Rio." "I may try to open a gym myself and inspire another generation or at least be an ambassador to get young people interested in the sport," he said. However, he has no thoughts of following team-mate and 2012 Strictly Come Dancing winner Louis Smith into Saturday night television. "There's no chance of that, I've got two left feet," he explained. Those two left feet also scuppered his football career, but have not stopped him becoming Scotland's most successful gymnast.